Observed on roadside vegetation in the Gatamaiyo Forest, Nakuru County, Kenya. Oct. 2016. Length about 6 mm. 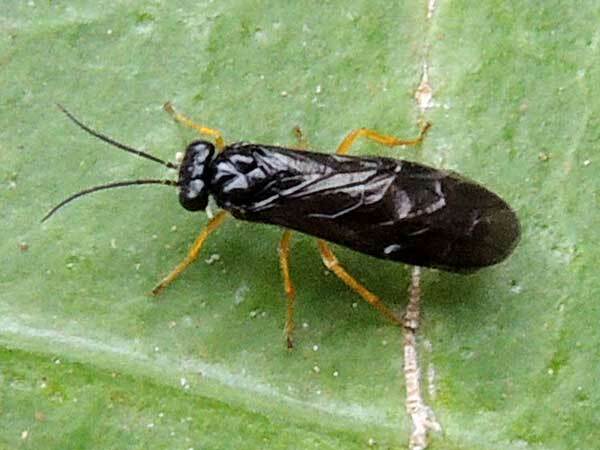 Sawflies belong to a ancient group of Hymenoptera which includes the bees and wasps. Sawflies lack the narrow 'waste' typical of most hymenopterans, and also sawflies are herbivorous. There are perhaps hundreds of species in Kenya and many are poorly known. The immature stages resemble caterpillars and feed on leaves. Most species are rather similar looking and are likely specific to a host plant. Copyright Michael J. Plagens, Page created 22 Feb. 2017.